I rode Elephant Rock Century today. Supposedly there were 4,500 people combined registered for the 62 and 100 miles rides. I am pretty sure 500 did the century and 4,000 did the 62 mile ride. At least that is what it felt like when the courses converged toward the end of the ride. That middle section, when it was only the century riders and me out in the Black Forest area north of Colorado Springs, sure was nice. I rode over rolling forested hills and open ranch land with constant gear changing to keep my mind occupied. 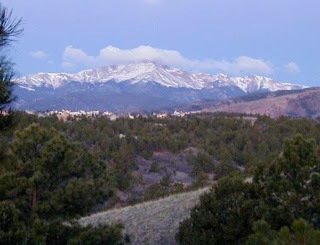 I enjoyed beautiful scenery with views of Pikes Peak in Castle Rock, Colorado. Still snow capped and at times shrouded in clouds, the weather is known to change rapidly around Pikes Peak's 14,000ft summit. I have ridden this century in years past in rain and hail, today I lucked out with perfect weather. It was a carefree and easy day out on the bike. If you weren't racing the City Park Crit today in Denver, or from Boulder (that is an inside joke because people who live in Boulder, never leave Boulder), chances are you were at Elephant Rock today. If you were, you joined me for 5,944ft elevation gain over 100 miles with cross winds and headwinds, and yes(!) tailwinds. ERock as it is called locally, is the season indicator for many riders in Colorado trying to gauge their fitness after a long winter's nap. Once ERock is ticked off the calendar, I know I am ready for the other event rides in the summer ahead. I am reminded that this all-over body buzz that I feel after riding 100 miles on a bike means that I have accomplished something today. And gives me the confidence to tackle France in coming weeks. France here I come! For now, Colorado is a beautiful place to ride a bike!